This research study is exploring the effects of different types of treatment that have shown to help children with speech sound disorders, including childhood apraxia of speech. Different teaching methods and different therapy schedules are being tested. Children ages 9-17 are eligible for the study. Children ages 9-17 years. We are recruiting children who have been diagnosed with, or who are suspected to have, childhood apraxia of speech (CAS). Children with hearing loss, cleft palate, autism or other developmental disability are not eligible at this time. Not all children may qualify; eligibility will be determined based on a phone screening as well as an initial visit. Children will be screened during a two-hour-long appointment. 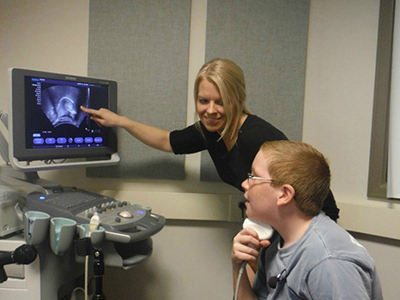 During this session, several speech and language tests will be administered. If the child is eligible, he/she may be invited to participate in follow-up speech therapy sessions. Children eligible for the speech therapy lessons will be randomly assigned to receive one of four different types of treatment. The treatments differ in the scheduling (two visits per week for 10 weeks vs. more intense treatment) and in the use of the teaching procedures (with or without visual feedback of the tongue during speech). All children who are eligible will receive 20 hours of free speech lessons, along with assessments tracking progress. There is no cost to participants. Families will be compensated $20/hour for testing plus $5/session for travel costs. $5/session for travel costs will be provided during speech therapy sessions.